My grandfather, Harry Warner, President of Warner Bros. 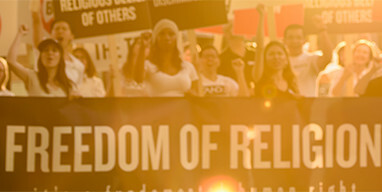 Studio for over 50 years, considered the medium of film and television “an instrument of peace.” Advertising on A&E’s Leah Reminis show demonstrates your support and encouragement of religious hatred and bigotry that leads to violence against property and people, which we’re witnessing more and more in our country. My family came to this country to escape religious persecution, so I find this one-sided, biased piece on the Church of Scientology and Scientologists terribly distressing. A&E and Miss Remini’s discriminatory attacks further a campaign that I know to be utterly false and degrading to a religious philosophy I have been practicing for 45 years. If what she is claiming is true there would be a judgment or conviction, which there is not. The only convictions were people who followed Leah Remini's hate campaign and committed felonies as she instigated them. Three people have been convicted of felonies to date. The numbers of hate phone calls, emails and threats to kill Scientologists that have flooded in during the airing of this series you too will be responsible because of your participation as an advertiser. I can only hope you will withdraw your support. If you don’t, I will promise to boycott your company and its products.